Regale Winery is beautifully sited on a hillside looking out toward Santa Cruz. On a clear day, the view must be breathtaking. Heck, the valley was thick with fog and it was still gorgeous when we visited. 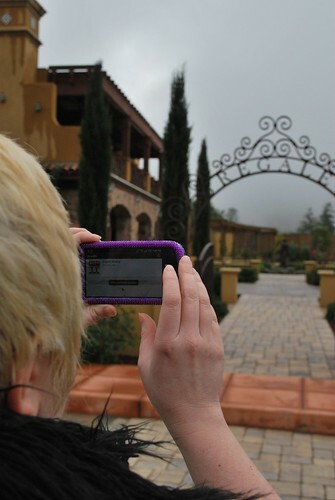 It’s a photo of Nikki taking a photo of the Regale gates! How meta! The grounds are very thoughtfully laid out; it’s clear the owners were focused on the tasting room as an event venue just as much as a spot at which to taste wine. They certainly put one in the mood for love, as you can see from this photo of Mike. 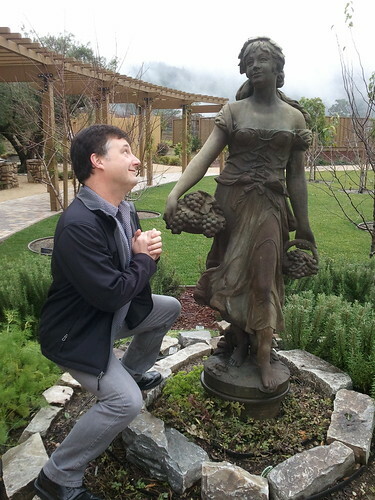 Mike plights his troth to a Regale statue. Regale Winery is located right next to Burrell School Winery, but was mysteriously not included in the Summit to Sea Wine Trail. The reason became clear when we got a look at their tasting list; not one of these wines is made from Santa Cruz Mountains grapes. We were thrown off our stride by the tasting fee. In Monterey County, we’re used to a $5 ceiling on our tastings, so it shocked our little wine-loving wallet to pay $10 apiece at Regale. But the staff was warm and friendly, so how could we say no? 2008 Russan River Valley Sauvignon Blanc: This wine was a disappointing start, thin and tasting more of oak than of citrus. 2006 Central Coast Chardonnay: Now we’re getting somewhere. This chard was a little nugget of butter wrapped in a warm, fuzzy swaddling cloth of oak. A little more fruit up front and it would be perfect! 2007 Pinot Noir, O’Neel Vineyard, Russian River Valley: Soft and drinkable. Like warm velvet on my tongue. 2007 Napa Valley Sangiovese: Oh no! I think my palate just died! All I could taste was woody bitterness, as if someone had juiced some acorns and served it to me in a glass. I ambled off to sample some of their divine bread and olive oil (sadly, neither was for sale). 2007 El Dorado County Barbera: This is a berry wrapped in several layers of grape skin. There was a dry texturalness to this wine. 2006 Cabernet Sauvignon: Chocolate and berry skins. Finale: Their desert wine is made from zinfandel grapes and fortified with an everclear-type alcohol the winemaker made from wine grapes, giving this a pure grape flavor. It’s like drinking a dark chocolate with a zinfandel filling. Good, but a strong alcohol finish at the back of the palate. 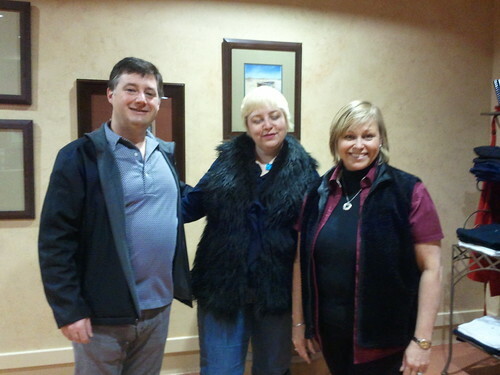 We pose with our friendly tasting room pourer. No, Nikki’s not drunk; the sound of the shutter clicking just makes her blink.